The Al-Quds Day Rally in London on 4 September has been called an “outstanding success” by Massoud Shadjareh, the Chairman of the Islamic Human Rights Commission, one of its main organizers. He also emphasised, however, that supporters of the Palestinians need to make a concerted effort to provide more concrete support to them. The annual rally, held in London at the end of Ramadan for the 30th consecutive year, was attended by an estimated 6-7,000 people, predominantly but not exclusively Muslim. It assembled at Marble Arch, in central London, at 2pm, and set off for the US Embassy in Grosvenor Square an hour later. There, the rally was addressed by speakers representing a range of anti-Zionist and pro-Palestinian organizations, including secular and religious Jewish ones. During the march through central London, the marchers were met by counter-demonstrations organized by right-wing British groups such as the English Defence League (EDL) and March for England (MfE), Zionist groups such as the Jewish Defense League (JDL), and Iranian opposition groups. However, the total number of counter-demonstrators was estimated at less than 40, and had little effect other than to energise the people who had come out to support the Palestinians. Throughout the event, marchers also met an overwhelmingly positive response from ordinary people in the streets, with several applauding or even choosing to join the march. 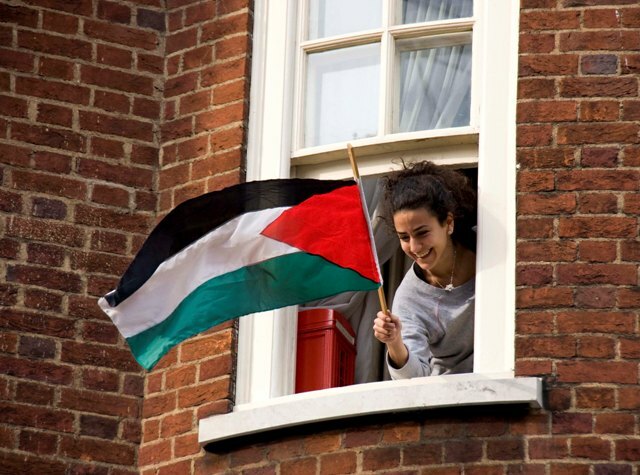 In some places, local residents hung Palestinian flags from their windows as the marchers passed. The rally was also addressed by Dr Daud Abdullah, Director of the Middle East Monitor; Taji Mustafa, Media Representative of Hizb al-Tahrir; John Rees of the Stop the War Coalition; and Shabeer Hussain. Rabbi Ahron Cohen, of Neturei Karta UK, an orthodox Jewish group that opposes Zionism, was also present but was unable to address the rally as it was the Jewish Sabbath. Instead, a pre-recorded message from him was played on a big screen. However, the greatest cheers were for a message of appreciation from people in Gaza, shown on the big screen, and for two young Londoners. Aliya Yassin read a poem about Gaza by activist Arzu Merali, and Karam Ali sang a deeply moving acapella version of Michael Heart’s classic song “We Will Not Go Down in Gaza Tonight”, written during the Israeli attack on the besieged territory in January 2009. Yaum al-Quds (Jerusalem Day) has been marked around the world for over 30 years, ever since the late Imam Khomeini declared that the final Friday of the holy month of Ramadan should be a Day of Remembrance for the people of Palestine and other oppressed people people around the world. Supporters of the event in London this year include the Muslim Council of Britain, the Stop the War Coalition, Jews Against Zionism, the Islamic Forum of Europe and the Federation of Student Islamic Societies (FOSIS). “It must be remembered that this rally in London was only one of dozens held all over the world at the end of this holy month of Ramadan. The fact that so many people turn out every year, despite the difficulties of fasting, is indicative of how strongly Muslims everywhere feel about the suffering of Palestinians and the cause of Palestine. We know that these rallies are much appreciated in places like Gaza, where people can sometimes feel forgotten and abandoned by the rest of the world. “But it is also heartening, both for us as Muslims in this country, and for the Palestinians, that the rallies are supported and attended by many non-Muslims as well. This shows that the reality of Zionism and the plight of its victims are widely recognized, despite the propaganda of Israel’s supporters and apologists.